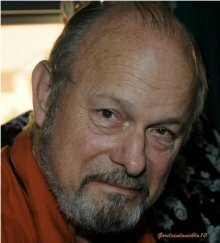 Joe Haldeman is perhaps best known for his 1974 novel The Forever War. "Tonight we're going to show you eight silent ways to kill a man." The guy who said that was a sergeant who didn't look five years older than me. So if he'd ever killed a man in combat, silently or otherwise, he'd done it as an infant. I already knew eighty ways to kill people, but most of them were pretty noisy. I sat up straight in my chair and assumed a look of polite attention and fell asleep with my eyes open. Twenty-eight years after Vietnam, the smell of roadkill still brings back the smell of days-old bodies rotting in the jungle heat. My first real telescope, which my father bought under grumbling protest when I was 12 or so, had a sleek black Bakelite tube, and for years I was out almost every clear night, peering at the stars and planets and especially the Moon. Haldeman shows that science fiction is not just glossy spaceships and aliens in space, at its best it grows out of the real human experiences of its writers. Not too much. It's nice to meet people who read your work. But while I'm writing, I don't think about the potential audience (unless it's being written for a specific commercial purpose, which is rare). I once got a letter four pages long, rather academic but very positive, which started a correspondence that ended with him writing a Ph.D. thesis (Warbody: Joe Haldeman's Killer SF, by Tim Blackmore). I, at least, found it fascinating. Hemingway and Fitzgerald are obvious. Carson McCullers and Flannery O'Connor on the distaff side. A large cask of vintage Bordeaux. And a nice glass. That it continue to be fascinating to me. If I can get up every day looking forward to the day's work, that's plenty. Every now and then a sentence is absolutely perfect. It chimes. Born: What, you think I was hatched? Yes, born. Oklahoma City, 2 June 1943.